It is common to see women wearing high heels on a regular basis. I have spoken to some about their choice in shoes and if it causes pain. 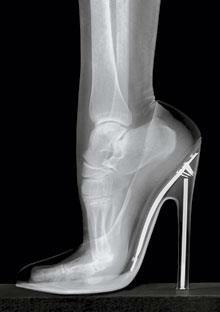 Most are adamant that the high heels have no ill affect on their body. Noticing the pride in their choice, I normally silence the chiropractor inside of me and not tell them the dangers of wearing high heels. What I would like to do is tell them that the dangers of repetitive stress (wearing improper shoes) on the body can cause arthritis. Proper posture is the key to decreasing the chances of developing arthritis, also known as Degenerative Joint Disease (DJD). Why is there a connection to your choice in foot wear and the pain in your back? The body is designed to maintain proper alignment. This is evident by the curves and the discs of the spine. They are designed to handle day to day tasks. However, if you decide to alter your posture by wearing high heel shoes, the joints are irritated, the spine becomes out of alignment and DJD is not far behind. DJD is the body’s way of handling the changes in your posture. How do you know if you have DJD? Other than experiencing the symptoms of arthritis, an x-ray is the best way to determine if you have the disease of not. Do you have to stop wearing heels forever? Will you be out of fashion for the sake of your spine? No. Everything in moderation and make good choices. If you occasionally wear heels for special events and choose heels that are lower in height, your spine will be able to handle the temporary change. In short, you don’t have to sacrifice fashion for better health. Just make better choices.